Business Modelling Associates (BMA) is proud to announce that technology partner, River Logic, a global innovator in prescriptive analytics, has been positioned as a ‘Leader’ in Gartner's Magic Quadrant for Sales and Operations Planning Systems of Differentiation. River Logic believes that it has been positioned as a leader based on the functional offerings of its Planning and Prescriptive Analytics Platform that has recently expanded to include a cloud-based scenario creation, visualisation and analysis component purpose built for business leaders. 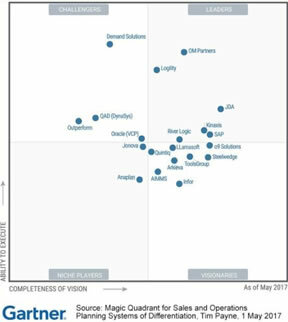 "We are proud to be positioned as a Leader in Gartner's Magic Quadrant for S&OP Systems of Differentiation," said Carlos Centurion, President of River Logic. "Although the functional capabilities of our platform span dozens of use cases outside of S&OP, we have seen tremendous value delivered to our customers who use us for S&OP, among other things. From serving a highly mature top 5 Global Consumer Goods Manufacturer to serving a business of less than 500 employees, our Platform enables companies the step-wise functionality they need to implement S&OP at any stage and continue to grow," finished Centurion. According to Gartner, Leaders demonstrate strong S&OP SOD vision and execution capabilities. They have depth in the key capability blocks of Gartner's S&OP SOD reference model. They are particularly strong in highly rated user requirements such as supply chain modelling, tight integration with a relevant SCP SOR, and financial impact analysis of plans and scenarios. Leaders are typically financially viable and have a viable S&OP SOD offering. They have mainly developed capabilities for acceptable software pricing and implementation costs, along with faster deployment timescales (through cloud platforms, process templating, configuration and portfolio simplification). They can demonstrate good market penetration through broad S&OP functional coverage in their solution(s) and numbers of S&OP SOD customers with broader S&OP functional penetration. River Logic has been a global innovator in prescriptive analytics (optimization) since 2000. Its platform — designed for business users — enables enterprise-wide optimisation, collaborative planning, and performance management, all delivered through a revolutionary user experience. By understanding how to best utilise cross-functional resources and manage trade-offs, companies make more impactful decisions. Business Modelling Associates (BMA) is a leading business analytics and solutions development firm operating in the UK, Europe and Africa. We design solutions that help clients systemically and holistically model their end-to-end operations, analyse what-if scenarios and explore how potential changes affect service, costs, investor returns, sustainability and risk. BMA helps companies compete and win by giving them the tools to visualise, analyse and optimise their key decisions.